The Indigenous People of Biafra (IPOB) has issued warning to President Muhammadu Buhari over the detention of its leader Nnamdi Kanu. Emma Powerful, the media and publicity officer of IPOB said Buhari’s advisers were deceiving him, Vanguard reports. According to him, prominent Nigerians who are meant to advise him have gone mute because they want his government to fail. He wondered the type of advisers President Buhari was surrounding himself with, if they were the ones telling him to resolve to fight everybody in Nigeria and also to continue killing innocent IPOB and other Biafra agitators. “We sometimes pause and pity the man because his advisers are not telling him the truth. If he has decided to exterminate this hated ethnic group, then he should wake up from his slumber. “How can Buhari’s APC government be killing innocent, armless and non-violent agitators on daily basis and he is keeping quiet? From who do the army, police and other security agencies take orders from? They should not push us to the wall. 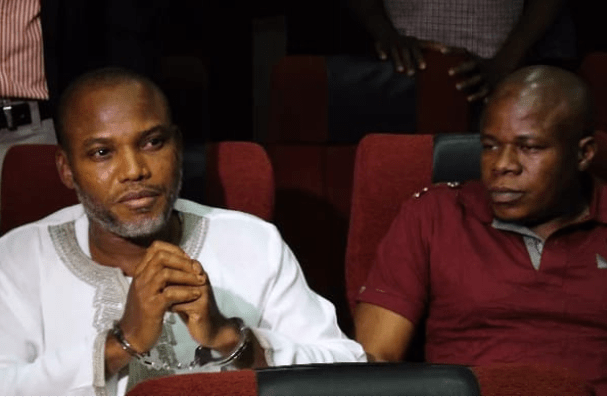 We have been warning that our leaders should be released without further delay,” the IPOB spokesman said. IPOB called on Buhari to release their leader in detention.